It has been sometime since I have posted on the ‘Eternal Exploration’ blog, around a year in fact. I started this blog as a place to share thoughts and activities related to my teaching and learning in geography, both at the school and university level. Since starting the blog I’ve changed jobs (and cities) a number of times (and my surname too). As a consequence the focus of my activities has changed, and while I very much still consider myself a geographer, the focus of my daily activities of work are now very differenet from when I was a PhD student, geography teacher, qualifications manager, or education writer. I am now a researcher in the Centre for Business in Society at Coventry University, which is a dedicated research centre in the Faculty of Business and Law (Geography now belongs to a different Faculty). I set my self the task at the beginning of this year to try and bring together some of my different teaching and research blogs into something more central which I could put to more use. I considered a new website, but in the end decided that what I needed to do was to do a little bit of re-organising on this blog, and once again act as a portal for writing about things that I’m doing, I’m interested in, or that I think would be useful to share, to more accurately reflect what I do now. And so this post is really me noting to myself (and anyone who happens to read this blog) that this is why the blog is now taking a bit of a different shape. I’ve often had idea for blog posts about some of my research and teaching activities which I wouldn’t previously have written about on here. So, in addition to writing about my geography teaching and learning activities that I’m still involved in, the blog will now take a broader focus to consider issues around research in the social sciences, and act as a platform to try and highlight some of the research areas I am working on. I should perhaps add that blog posts at present may not be that frequent as I am currently on maternity leave, and very much enjoying the time with my 3 month old daughter. If there was a qualification in nursery rhymes, I’m pretty sure I could pass it! Having a child has led me to look at the world through fresh eyes. I travel to places that I’ve been to a hundred times before, and I’m excited that she gets to see these places for the first time, particularly as she’s becoming more aware of her surroundings. It’s also provided me with a bit of time to think, about what I want to do with my research and teaching in the future, and where I want to focus my energy during work time. Hopefully through this blog you’ll be able to see a bit of how this journey pans out. So, that’s it for now, a bit more of a personal blog post than usual – there’ll be more from my ‘explorations’ soon. Last year at Villiers Park Education Trust as part of the ‘Geographical Imaginations‘ course I delivered a new session which focused on cities. In previous years I had spent the time to explore sustainable cities and what that meant in different areas of the world. This year I decided to start the session ‘Urban Lives’ by exploring the concept of ‘Happy Cities’ after reading an article by Dimitris Ballas, ‘What makes a ‘Happy City?‘ which thinks about quality of life in cities, and the book by Charles Montgomery, ‘Happy City: Transforming our lives through urban design‘. Both made me think about what I would consider to be a happy city. A TED talk with Charles explores explores what happens when you take an abandoned NYC space and infuse it with social experiments. The results are surprising and inspiring. Shortly after reading these I came across the book, by Jaime Lerner, Urban Acupuncture, which not only argues that in many cases ‘the city is not the problem, it is the solution’, but suggests that “good acupuncture is about understanding places better, understanding that one city is not like the other, understanding what it is that is missing in a neighbourhood before designing”. He explores cases from around the world where interventions have been made to help cities. The TED talk ‘A Song to a City’ provides a good overview of his ideas. I put some of these on to a worksheet to ask students which they think would work best in their own home town or city. The rest of the session explored different urban problems, as well as ways cities have been making efforts to become more sustainable. You can view the slides from this session below. After the session I also came across a piece of research which is continuing to explore the concept of happy cities to create a Happy City Index, as an alternative way to measure progress and prosperity in the 21st century. There are lots of ways you can explore ‘Happy Cities’. The Geographical Association has been somewhere I have continued to turn to as a source of teaching resources and support throughout my teaching activities at various educational levels – from the PGCE when the Secondary Geography handbook was an introductory guide to the geography classroom, the fantastic annual conference, to some of the top-spec toolkits to inspire ideas for developing sessions with students who were about to study geography at university. Two publications from the GA that I’ve been looking at recently are part of a series of Teachers’ Toolkits, alongside others on rocks, glaciation, China, Africa, landscape of the UK, flooding, climate change, water supply and demand, Kenya’s flower industry, human and physical geography of the UK, population change, and urban regeneration (and even more if you look at the toolkits produced for KS4, and the top-spec kits for post-16 groups). These toolkits provide all the resources you need for some packed lessons, with plenty of activities, as well as enough information to make sure you know enough about what you are teaching, a glossary of key terms, plus lots of links to places with further information. A medium term plan is included to show how you might structure a scheme of work, with lots of detail including key questions, objectives, activities, resources and assessment activities. While this is shown for a whole scheme of work on the topic you could easily adapt this to fit around some materials you may already use. Both toolkits I have here come with a link and code for the GA website where you can download a set of resources to accompany the book too (activity sheets, information sheets and powerpoints). In ‘Introducing India’, Catherine Owen asks ‘What are the Opportunities and Challenges for the future?’ The book begins with a question I have often heard when talking with teachers on how to teach about a particular country: ‘How can we teach about this complex country without falling into the trap of over-simplification?’ Her answer: be selective. And while that might seem like an obvious answer, what is provided here is an excellent selection of lessons to do exactly that. A series of 10 lessons include: Incredible India (human and physical characteristics of India); Growing India (population and economic change); Diverse India (different features across India and its challenges); Changing India (urbanisation); Innovative India (TNCs); Industrious India (poverty and fair trade); Thirsty India (water management); Destination India (tourism); Future India (opportunities and challenges for the country), and What have you learnt about India? Each lesson includes a starter, main activity, and plenary as well as helpful teaching tips. I particularly like the lesson on urbanisation which involves the students playing a board game to explore the various processes associated with urbanisation. In ‘What’s the use?’ Richard Bustin asks ‘How can we meet our resource needs? highlighting how important it is that we teach about resources and sustainability, as an ‘increasing demand for resources has created a complex global geography’ (p.5). A series of 10 lessons include: The stuff we use (resources and their distribution); Resources forever (sustainability); Power to the people (electricity); Black Gold Russia’s Oil (Russia, oil and the UK); Something fishy going on (tuna and marine ecosystems); A net result (sustainable fishing); Diamonds are forever? (diamond’s as a resource); Sierra Leone’s resource curse (diamonds and Sierra Leone); Made to Last? (resources and the human population); and Costing the Earth? (global resource futures). I’ve written in the past about natural resources, and when trying to create resources for schemes of work on the topic I’ve found it quite difficult because there are so many resources which could be covered, and so many different issues which could be included. However, in this set, using a consistent theme of sustainability the lessons provide a good overview of some of the key issues related to natural resources with some vivid case studies to illustrate. I particularly like the lessons on tuna and sustainable fishing. I think the ocean as a natural resource has been overlooked in the past (compared to other resources like coal or oil, and diamonds) – although as shown, here this is changing. I have not yet had the chance to teach any of the activities from these books but I have already integrated some of the activities into some of my future lessons and lectures. Whatever age group you teach, if you are covering topics related to India or natural resources then I would highly recommend these toolkits, (and likewise the other toolkit volumes in the series) as a great starting point, providing information, ideas and inspiration, and ready-made resources. I often get asked by students from secondary school to postgraduates about strategies to gain a broader knowledge of geographical issues, and how to ‘read around the subject’ as they are often instructed to do. Many students cite lack of spare time to sit and read in addition to the work they have been set by teachers and lecturers. While continuing to read is important I find listening to podcasts a great way to learn about a wide range of topics from Californian droughts, to robots in the workplace, to the future of energy production. I tend to listen to the podcasts when I’m exercising, walking to work or travelling. 1. BBC Business Daily. The website describes this podcast as ‘the daily drama of money and work from the BBC’ and I really don’t think this does it justice. Yes, the podcast does discuss relevant issues to the business world, but the diversity of topics is vast, and they usually focus on topics in the news providing a wealth of up to date case study material, and insights into geographical issues that are happening in the world today. The podcast is around 17 minutes long and recent relevant episodes include: ‘Fast Growing Mozambique’, ‘Paris Climate Pact: Corporate Winners and Losers’ ‘Gold and Oil in Ghana’, ‘California: Fruits, Nuts and Drought’ and ‘The Economics of Migration’. 2. From Our Own Correspondent. This includes analysis from a host of the BBC’s correspondents, journalists and writers about various stories in the headlines. It’s usually presented by Kate Adie and lasts for around 28 minutes. To get a flavour of the type of material in the podcast I would highly recommend the recent ‘Special Boxing Day Edition’ which looks back at some of the various historic ‘From our own correspondent’ despatches, or one of my favourite episodes from 2015: ‘The Night Train in Luxor’ which includes insight from Egypt, the UK, China, South Sudan, Australia and Afghanistan. 3. BBC Documentaries. There are a wide range of documentaries over the year covering all sorts of topics, but again they often have issues of interest to geographers at their heart. For example, recent relevant episodes include, ‘Young, clever and Libyan’ which follows tech graduates in Libya and their hopes for rebuilding their economy, ‘The year of migration’ which discussed the migration patterns witnessed in 2015 from Africa, the Middle East and Asia, ‘Online Shopping Indian style’ exploring the recent growth in internet shopping in India, ‘Changing Climate change: Politics’ examining key issues around climate change in the political sphere. 4. TED Talks. Drawing from the various TED conferences around the world, these podcasts have lots of short talks from ‘the world’s leading thinkers and doers’, lots of inspirational people, or people with big ideas at least. You can also watch the videos on the website as there are often visual presentations to go with the audio. Some recent relevant episodes include: ‘The four fish we’re over eating – and what to eat instead with Paul Greenberg,’ ‘My country will be underwater soon by Anote Tong’, ‘Climate change is happening. Here’s how to adapt from Alice Bows-Larking’ and ‘A year reading a book from every country in the world’ (a talk which inspired my project for the year on one of my other blogs, ‘A Geographer’s Kitchen’). 6. Discovery. Episodes covering various aspects of the scientific world which often have geographical issues at their core. Recent relevant episodes include: ‘The power of energy’, ‘Humboldt – the inventor of nature’, ‘Unbreathable: The Modern Problem or Air Pollution’ and the ‘The Future of Biodiversity’. 7. BBC Business Matters. These are much longer programmes than the ones on BBC Business Daily and usually go into a lot more depth into some of the key issues in the global business world. For example, recent relevant episodes include ‘Six Routes to a Richer World: China, India’, ‘El Nino weather could be as bad as 1998′, and ‘India blocks Facebook plan’. 8. Foreign Policy: Global Thinkers. There are a number of podcasts from the magazine Foreign Policy but I particularly like the Global Thinkers series to learn about how particular individuals around the world are influencing global trends, issues and events. Recent episodes include: ‘Epidemics on the move’ and ‘Which International Architecture rules the world? 9. BBC Inside Science. Yet another BBC podcast, this time exploring various scientific mysteries and challenges. These vary a little in length but are usually between 30-40 minutes. Some of the relevant recent episodes include: ‘Flooding, scientific modelling, magnetoreception, escalators’, ‘Antarctic ice sheet instability, groundwater, fluorescent coral’ and ‘El Nino, sphagnum moss and peatlands, inside CERN, measuring air pollution with iPhones. As you can see from the title each episode covers a range of issues. 10. BBC The Food Programme. This podcast is usually just under 30 minutes long and covers a host of food related topics, from the development of particular food trends, regional food specialities, to the history of particular food culture. I’ve learnt so much about different food cultures through this programme and I particularly like the section on the Ark of Taste, a global project which is attempting to catalogue traditional ingredients around the world, from local varieties of peppers to rare regional varieties of fruits and vegetables. Recent relevant episodes include ‘China towns’ ‘A milk appreciation’ How did the chicken cross the world?’, ‘Stories from Syria’ and ‘Fast food workers’. There are actually a lot more podcasts than this that I think would be of interest for geographers, but I thought 10 was enough to start with. If you find yourself looking for even more then the following are also worth a listen: TED Radio Hour, Peter Day’s World of Business, The Bottom Line, Outlook, Analysis, Science in Action, File on Four, and Unreported World. The links in this blog post take you to the websites where you can find out more about the podcasts, as well as play and download them individually if you wish. Although, most mobile phones will have a podcast app which will let you subscribe and download as many podcasts as you want. I’ve learnt so much from listening to podcasts listed here, although I should also highlight that I have ended of buying quite a few additional books because often I hear about a book, or an interesting author, or about a topic that I think I would like to know more about. So while the podcasts are free, it has ended up costing me some money – but it’s a good excuse to go and browse around book shops anyway. But overall my reading has been expanded by listening to these podcasts, and I get the chance to learn about all sorted of topics that I wouldn’t necessarily have the time to read about otherwise. 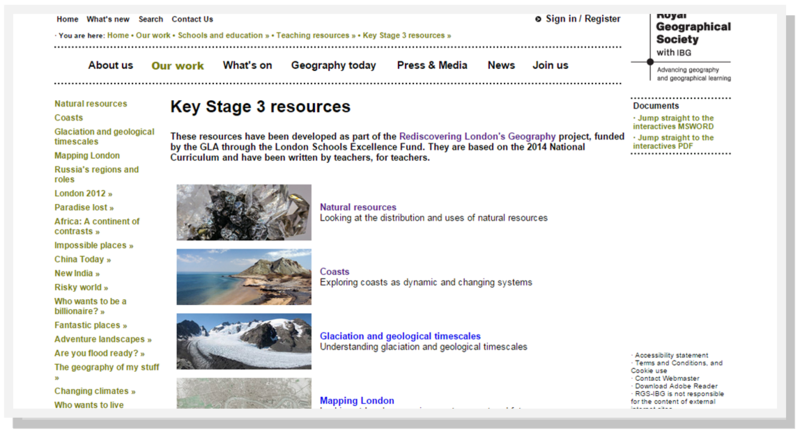 Earlier this year I posted about a series of resources produced by the Royal Geographical Society for Key Stage 3 Geography as part of the Rediscovering London’s Geography project, including a set on Natural Resource which I produced. In addition, there are also a series of resources for Key Stage 1-2 Geography as well. Canyons and valleys: physical landscape: This lesson now moves on to consider the USA in closer detail. The aim of this lesson is to build on the pupils’ understanding of the physical. They will begin the lesson by watching a time lapse video to move through different landscapes and then move on to examine how the Grand Canyon formed. Where are all the people? This lesson focuses on the distribution of human beings in the USA and provides insights into the different types of settlements across the country. This lesson involves pupils comparing the demographic characteristics of different states in the USA. Challenged by water: This lesson considers key interactions between physical and human landscapes, in particular the impact of water supply distributed across the country and what happens during water related disaster events. If you teach Key Stage 3 Geography – or have an interest in the topics that are being taught at this level you may be interested in a new suite of teaching resources that are being developed by the Royal Geographical Society as part of the Rediscovering London’s Geography project. 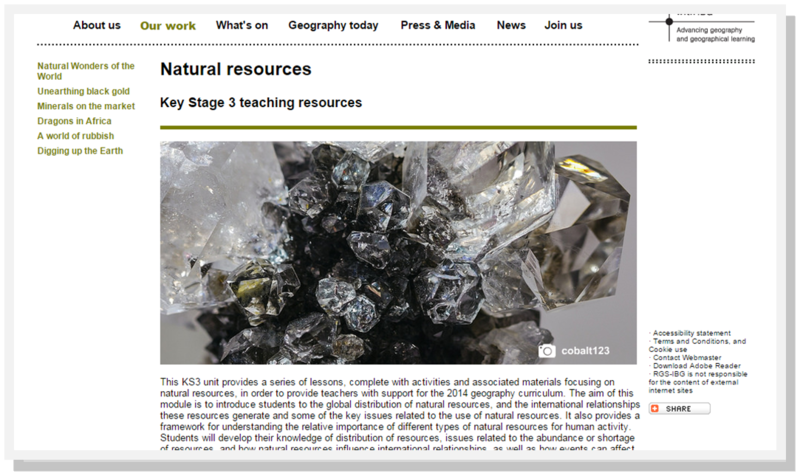 In addition the unit I produced on Natural Resources was also recently added to the website. Natural Wonders of the World: this lesson introduces the key natural resources found on the planet, their distribution and value. Unearthing Black Gold: this lesson provides an overview of where oil comes from, where it can be found and how important it is for daily life as well as raising awareness of declining supply. Minerals on the Market: this lesson explores issues related to commodity markets introducing the idea that natural resources are extremely valuable and that there are a complex series of international interrelationships based on these resources. Dragons in Africa: this lesson will help you explore where Chinese investments are taking place in Africa and the different sectors they are investing in. A World of Rubbish: this lesson will focus around tracing what happens to different types of rubbish, where rubbish is transported to be sorted and recycled and the ways in which different countries are involved. Digging Up the Earth: this lesson begins by exploring diamonds as a natural resource before moving on to look at rare earths. One Billion Hungry Can We Feed the World? Fact and Figures: which is a short document which provides some of the key facts and figures that stem from the book and the accompanying blog. UN Water Security and the Global Water Agenda Summary Policy Brief. To begin the session the class listened to the BBC Business Daily podcast: World Water Crisis with the task of identifying any key issues related to global water security. The session then continued with a discussion of the pre-course reading and podcast content which highlighted the inter-related and highly complex nature of global water and food security. I’ve completed a recent session on the same topic but with a short lecture at the beginning. The slides and notes for this session can be found here. If you are looking for more activities related to water security. I devised a policy brief group task which can be downloaded here: UN Policy Brief Challenge. The session essentially challenged students to think about some of the key global issues that face today’s societies – food and water security.